It's ok if you need to miss one of the sessions over the 6 weeks. It's ok if you have to miss one of the sessions over the 6 weeks. This program covers the same content as "Inspired by Equus", just with a focus on birding. It is also equine-facilitated. It's ok is you need to miss one of the sessions over the 6 weeks. Do you tend to get harsh with yourself during difficult times? Do you have feelings of not being good enough? Do you struggle with feelings of not belonging? Showing gentle, non-judgemental kindness towards ourselves, especially when things aren't going well, is very important to overall well-being. Unfortunately, we live in a society that promotes competition, leaving us feeling we must prove ourselves to be worthy. Yet, no matter what we do it never seems to be enough. 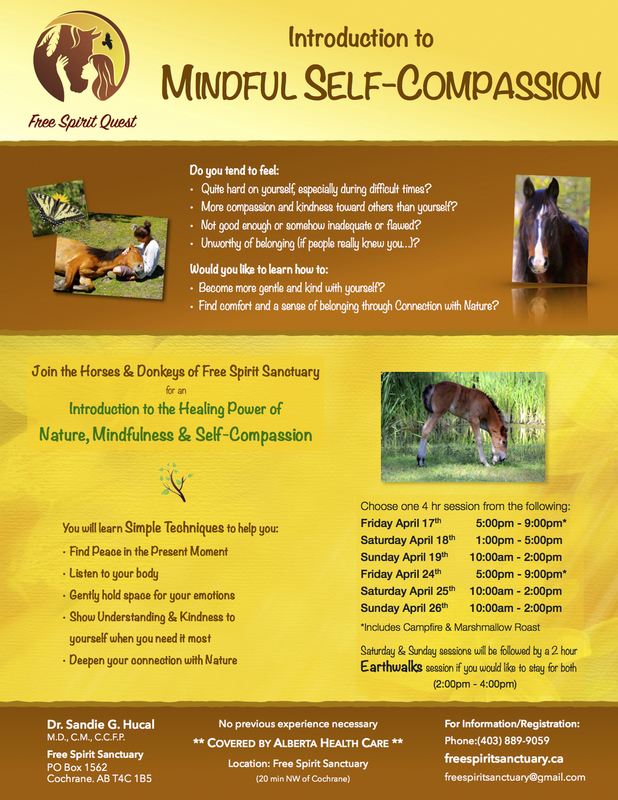 The FSS herd and I would like to help you learn about the importance of self-compassion and guide you through some practices that you can do at home to help you become more kind and supportive to yourself. Self-compassion is absolutely essential to be able show compassion for others in a healthy, balanced, sustainable way and to develop resilience during challenging times. This workshop is especially helpful for those who spend a lot of time caring for others and tend to forget about or have little energy left for themselves. **Note: This workshop consists of one 4-hr session. Please choose one of the dates listed on the poster and enter it on the registration form. Our workshops are covered by Alberta Health Care as they focus on different issues or challenges that have the potential to significantly impact an individual's wellness and overall functioning in various aspects of their lives. Although the goal is to help people improve their sense of wellness, they are not "wellness" programs per se, in that they are not focused on people who would overall consider themselves healthy and well and simply want to pursue self-growth or learn about mindfulness. Although self-growth is a part of the therapy process, it is in the context of an individual experiencing a physical or mental health condition or life circumstances/challenges that affect their overall physical-mental-emotional-spiritual wellbeing. Stress Resilience is vital to our health & wellness. This is an introduction to the effects of stress and how to best deal with it and heal from it. This valuable information can be helpful not only for yourself, but also your family, companion animals, etc. This will be the pre-requisite for further programs related to stress and trauma. Discover the healing power and peacefulness of being fully present in the moment with the guidance of our equine masters of mindfulness. This workshop is the prerequisite for most of our other programs. Date & Time TBA: Workshop will be scheduled once 4 people available at same time. The Horses & Donkeys of Free Spirit Sanctuary invite you to come "Celebrate the Fall Equinox" by setting an intention that with nurturing will give birth to something new in your life by the Spring. In a world that can sometimes feel overwhelming, learn how to thrive by embracing and nurturing your high sensitivity. I felt inspired/called to offer this 6 hr workshop this Sunday. This may be our last weekend of the season with such beautiful weather. If I can get 4 people signed up I will offer it. Join the horses and donkeys of Free Spirit Sanctuary for a fire meditation and vegan hot chocolate during the most magical time of the day- twilight. Discover the healing power and peace of being fully present in the moment. Discover the healing power of mindful presence in the moment.